This page brings together illustrations of miscellaneous leather products which do not (yet) have their individual pages. These are not minor items; they just await the expansion of this web showcase. Description : Jewellery box in cow polished black leather. 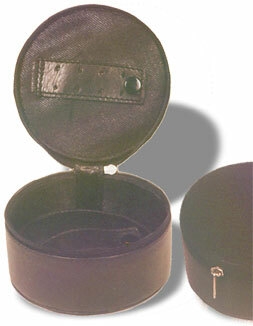 The inside of the lid has a small loop with holes to keep ear-rings. The compartment has two removable dividers for keeping jewelry safe from damage. It is also available in other types of leather and the colours you can get are black, brown, burgundy and blue. 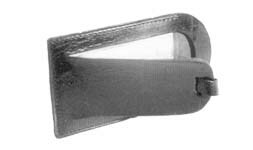 Description: A leather CD cover in cow polished black that shuts with a velcrow flap. Inside are 10 transparent pockets for keeping the CD�s. It is also available in other types of leather. 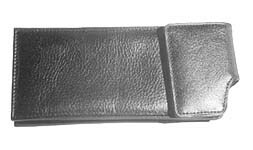 A leather luggage tag. Every suitcase needs a tag. Its size is 9.5 x 5.5 cm. There is a leather flap covering the window that displays your name and address. It has small band with a buckle that can be strapped to the handle of your case. It could me made from any type of Cow or Buff leather. The colour can be black, wine, brown, green, yellow and grey. A leather case of glasses that has a loop at the back. This loop allows the case to be attached to your belt. The size of the case is 8 x 17 cm. A flap with Velcro shuts it. It is a leather tri-fold wallet. The open size is 24.5 x 10.5 cm. It has one note compartment, two window compartments, 12 credit card slots and 4 side pockets of size 10 x 6.5 cm. It can be made in Black, Brown, Burgundy & Blue.